High Military award for exemplary gallantry during active operations against the enemy in the air. In the centre,there is alaurel wreath around the RAF monogram,surmounted by an Imperial Crown. The award was established on 3 June 1918, shortly after formation Royal Air Force. MEDALS - BRITISH GVI. DISTINGUISHED FLYING CROSS ( DFC ) - FULL SIZE. DISTINGUISHED FLYING CROSS ( DFC ) - FULL SIZE. Distinguished Flying Cross. The Distinguished Flying Cross is awarded. flying in active operations. Full Size . Written on it. have The Word. DISTINGUISHED FLYING CROSS. Condition is Used. Dispatched with Royal Mail 2nd Class. FULL SIZE DISTINGUISHED FLYING CROSS MEDAL DFC MUSEUM COPY MEDAL WITH RIBBON. The award was established on 3 June 1918, shortly after the formation of the Royal Air Force (RAF). It was originally awarded to RAF commissioned and warrant officers. A bar is added to the ribbon for holders of the DFC who received a second award. ‘DISTINGUISHED FLYING CROSS’. KING GEORGE VI (WWII). COPY OF A FULL SIZE MUSEUM QUALITY DIE STRUCK. DISTINGUISHED FLYING CROSS. WITH RIBBONS. STAMPED COPY TO REVERSE. JUST TO CONFIRM THIS IS A FULL SIZE COPY NOT AN ORIGINAL. DISTINGUISHED FLYING CROSS. Established in 1918 for officers and warrant officers of the RAF in respect of acts of valour while flying in active operations the enemy. 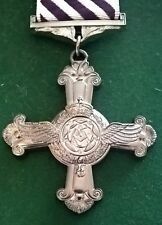 Distingished Flying cross dated 1945. Photo copies of flight logs and sorties from 1942 onward. 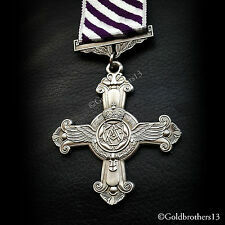 A nice original WW2 George VI Distinguished Flying Cross. D.F.C. in original box. The box has Royal Mint stamp, has excellent hinges and closes correctly. History The award was established on 3 June 1918, shortly after the formation of the Royal Air Force (RAF). 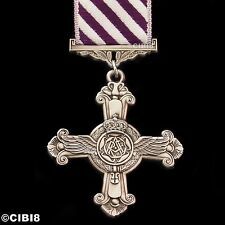 It was originally awarded to RAF commissioned and warrant officers. A bar is added to the ribbon for holders of the DFC who received a second award. 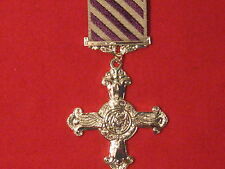 This genuine official MINIATURE issue of the Distinguished Flying Cross award is die struck in bronze. It is complete with the correct ribbon with brooch suspension. Contained in correct dark blue issue box. A cast replica of a Distingushed Flying Cross hand polished and aged toned. It is also given to those who display heroism while working as instructors or students at flying schools. Colonel Francis S. "Gabby" Gabreski, USAF, received 13 Distinguished Flying Crosses—the most earned by any individual. WWII ISSUE AAF STYLE DISTINGUISHED FLYING CROSS RIBBON BAR. UNMOUNTED NO HALLMARK. This is a ribbon bar it has a very smart system that produces a very tidy end result.